Below you'll find a list of the most common questions we get asked by individual and small group ski travelers. We do our best to answer as many questions as we can here, but if you don't see your question below, you can always contact us here. Can I bring 20+ of my closes friends with me? Totally! This is what SkiSync specializes in. We are the group travel gurus and can help you customize a trip from the resort selection phase to booking talent for your private event. Submit your Group Trip Quote and a SkiSync representative will be in touch. What if I've got less than 20 people in my group? We’ve got you covered. To better handle your specific request please submit your Group Trip Quote so we can direct you to the right team to take your reservation. I’m traveling with kids, can you help? Whether this is your first or fiftieth family vacation with kids we understand the process of finding family friendly mountains, lodging, activities, etc. Submit your traveler information and one of our travel specialists will be in touch soon to walk you through the process. Just because you’re an adventurous person and your buddies are being lame, that doesn’t mean you should be left out of the fun. There are several ways to travel by yourself and use the SkiSync services. Submit your traveler information and one of our travel specialists will contact you soon. What should I pack for my ski trip? Don’t worry we have an easy solution. 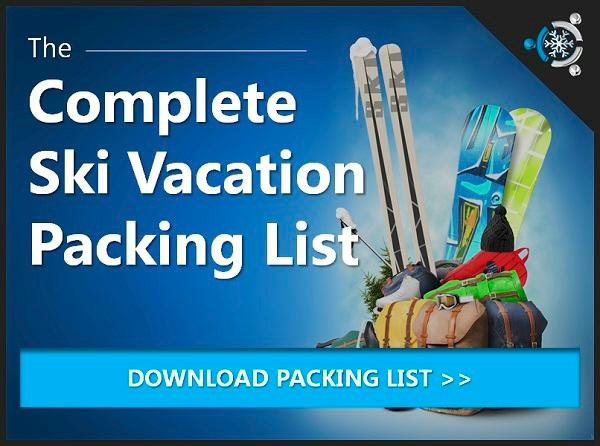 Just download our Complete Ski Vacation Packing List for a simple, printable checklist to use. What if I don’t own any ski gear? Excellent question! We have the perfect answer – GetOutfitted. GetOutfitted is our trusted vendor for renting everything from a ski jacket and pants to goggles and gloves PLUS they ship it directly to you at the resort. No need to bring an extra suitcase for all your ski gear. On the last day of your ski trip vacation simply pack the items back up in the box and schedule shipment. See, we knew you’d like it. Is it best to rent my gear? Renting is always an excellent idea, even if you own your own stuff. Airline baggage fees can get pricey so why not avoid those! Plus, you’ll have an extensive selection of the newest equipment available at a discount through the SkiSync approved vendors. How do I select the right rental equipment? Rentals are broken down in to multiple levels (ie Beginner Sport, Intermediate, Advanced Demo or Level I, Level II, Level III). Typically beginner skier/boarders would want to start with the Level I, beginner, packages. You can always speak to the onsite shop staff when picking up your rentals to ensure you’ve selected the correct package. Any changes to your pre-paid package can be resolved onsite at the rental shop but we highly suggest booking in advance to receive the group discounts. Most group discounts are not available for “day of” or “walk up” rental selections. If I want to try both skiing and snowboarding, can I purchase both types of rentals? If you’re new to the slopes or an infrequent visitor to the mountains, our suggestion is to stick to one discipline (ski or board, not both) since your days on the mountain are limited. However, it is absolutely possible to rent both types of equipment using the same lift ticket. To avoid doubling your rental expenses, combine your days and return your rentals when they’re not being used. Winter storm systems are constant this time of year, and serve as an excellent reminder of the benefits available with travel insurance. When planning travel during potential winter storms, travel insurance benefits include trip cancellation, travel delay and missed connection benefits. How do I obtain travel insurance for my upcoming trip? Your Destination Expert/Agent will explain all the details and can even send a policy brochure prior to booking (if requested). Additionally, you can receive discount insurance rates here. Where do I find my invoice and trip itinerary? Your confirmation is emailed to the address provided during booking and will contain all reservation details including check-in directions, a list of purchases, payments made and payments due. What if I need to make changes to my invoice? We recommend contacting your agent. You'll find their phone number listed on the confirmation email that was sent to you. What if I need to change or cancel my flight? Your agent’s individual phone number is listed on the confirmation email. Contact them as soon as possible so they can cancel all or part of your trip in accordance with the cancellation policies. What if I need to cancel my entire trip? Anyone traveling outside of the United States (including Canada and Mexico) will need a passport. Refer to the government passport website for information on how to apply or renew your passport. Make sure to give yourself ample time to complete the application and renewal process! How will I know if a visa is required for the trip I’m taking? SkiSync recommends you check with your local embassy as visa rules can change without warning. Embassy websites in your home country are the best place to look for information about requirements, visa costs and required forms. Where do I go when I get to the resort? Detailed instructions are provided on the emailed booking confirmation. If you have additional questions, contact your agent using their phone number listed on the confirmation email. What time can I check-in to my lodging accommodations? Generally your room is available after 4:00pm. If you arrive earlier, you’ll be able to store your luggage at your property and head out to explore for a couple hours. Where do I pick up my lift tickets, lesson vouchers, rentals, etc? Detailed instructions are provided in the booking confirmation email sent to you. If you have additional questions, contact your agent using their phone number listed on the confirmation email. What is customary for tipping when I’m traveling in the mountains? Your service providers will be so happy you asked! Here are a few people who would appreciate tips that you may not have thought about – shuttle drivers, baggage handlers, hotel concierge and lesson instructors. SkiSync employees do not accept tips (only coffee and high fives). What if I have specific questions about my lodging accommodations? Contact the front desk of your lodging property during your stay. They can provide direct assistance with questions about your unit. Who do I contact with questions about my trip invoice? Who do I contact to file an insurance claim? The process for filing a claim depends on when and how you purchased your insurance. For specific instructions, please refer to your invoice and/or call your reservation expert. Who do I contact if my flight is delayed/cancelled because of weather? Contact your hotel notifying them of your delay. If you’ve pre-booked a car or airport shuttle, please make them aware as well by calling directly. I'm searching for deals but the site seems slow - what the heck? Slow loading times can be attributed to heavy traffic. We appreciate your patience and know that we are working constantly to enhance your booking experience!